I grew up about an hour from Dallas and lived there for 30 years. I’ve since gotten married and moved to the hill country to raise a family. I still get back up to north Texas at times to visit my folks, who themselves now live out in the country a few hours from the Dallas Fort Worth Metroplex. When there, I have recently tried my hand at photographing the Dallas Skyline and Fort Worth Skyline from various perspectives. From the east side of Dallas, this Dallas skyline image was taken about 45 minutes after sunset from an overpass on I-30. Standing on an overpass in Oak Cliff on the east side of Dallas isn’t my idea of a fun evening, but when you can find locations like this for capturing a Dallas skyline image, I’ll try it. I make sure I bring a buddy, and in this case, my dad. We made quick work, parking, running to the overpass, taking some long exposures, then running back to the car where we felt a little more safe. We did have a car slow to a crawl when driving by – windows pitch black. I shudder to think who was behind those windows and I didn’t want to stick around and let them have another pass at us! 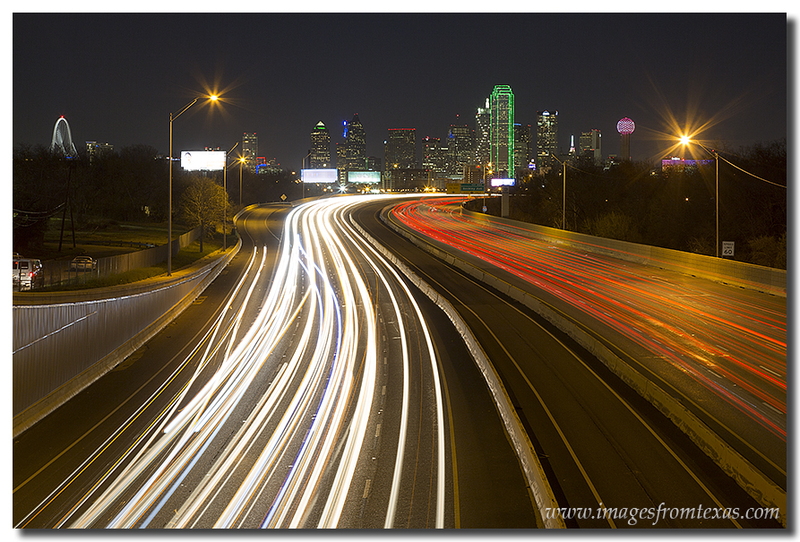 This is one of the Dallas cityscape images I escaped with. The Dallas skyline is beautiful at night. Reunion Tower is on the right, the Bank of America Plaza (the green building) is in the middle, and on the far left you can see the new Trinity River Bridge (also called the Margaret Hunt Hill Bridge). Reunion Tower is the 5th tallest observatory in the United States. In the middle of the image, outlined is green, is the tallest building in Dallas, the 72-story Bank of America Plaza. The Bank of America Plaza is, at the time of this posting, the 22nd tallest building in the United States and 3rd tallest in Texas. To the left of the America Plaza is the Renaissance Tower, a 56-story building finished in 1987. Further to the left of the Renaissance Tower and the Bank of America Plaza stands the triangular, 62-floor Fountain Place. With cars zooming to and from the city in front of me is Interstate 30. These buildings, along with many others, give the Dallas skyline a classic feel and a sight worthy of viewing. The Dallas Skyline as seen from Interstate 30 East of Dallas. One of my favorite places in Austin is the walk along the Zilker Park Hike and Bike Trail. You can find great views of the Austin Skyline, great downtown Austin panoramas, and you can watch the scullers flow by on Ladybird Lake in the early morning hours. There are also swans and ducks bobbing in the cool waters. If you like to run or bike, there are miles of trails to enjoy. If you enjoy photography, one of the locations I like to visit is at Lou Neff Point. This little part of the rocky shoreline grants a view looking down the river towards downtown Austin. In this image of the Austin skyline, I arrived at Lou Neff Point well before sunrise to figure out what I wanted to do. The clouds were seemingly pretty thick, so I was wondering about my chances for good light and colorful clouds. 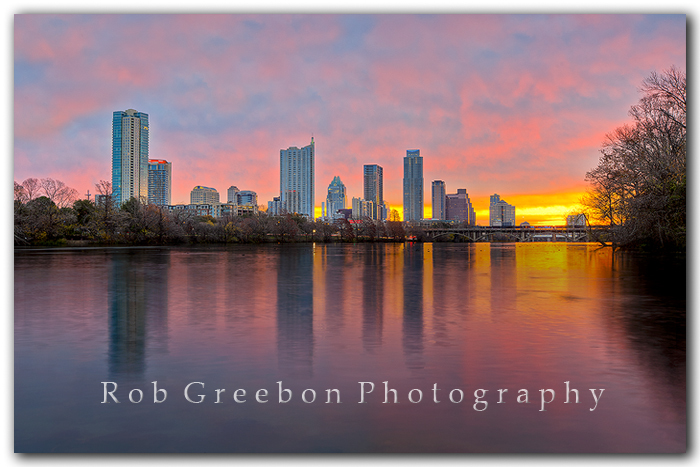 As the sun started to rise, I was rewarded with some soft oranges and pinks over the Austin cityscape. This image was taken in December, so a chill was definitely in the air – cold for even Austin. I’ve also seen folks doing portraits at this location. You have a great backdrop! But no matter where you are on the Zilker Park Trail, it seems all the views are pretty good. Enjoy, and thanks for looking! This image of the Austin skyline was taken from Zilker Park along the hike and bike trail. The morning was cold and crisp and steam was rising from the water. The Austin Skyline from the best seat in town! I’ve photographed the Austin skyline from many different angles and perspectives… I’ve shot from the ground, from a boat, and from the tops of several high rises including the Austonian, the 360 Condos, the Milago, and the Hyatt. I’ve also photographed in all kinds of weather – even in snow on Pennybacker Bridge! Last year on a cold morning, I awoke before sunrise and drove downtown to shoot from the Long Center. I arrived well before first light and spent some time exploring. I ended up spending most of my time taking images of Austin near the reflecting pool just west of the Long Center. While there, I noticed a bench that had a wonderful view if you happened to be sitting there. Also, a fog was slowly rolling through the Austin cityscape. I set up and tried to capture my vision – sharing with the viewer the peace of that scene – the Austin skyline with some of the highrises slipping out of the low fog. I ended up returning here several times. Every morning, and elderly couple came through here – before sunrise – walking their dog. We never spoke, but they smiled, and I smiled, not wanting to disturb their serene time before the rush of life begins. I also captured some black and white Austin images from this location that I really like. 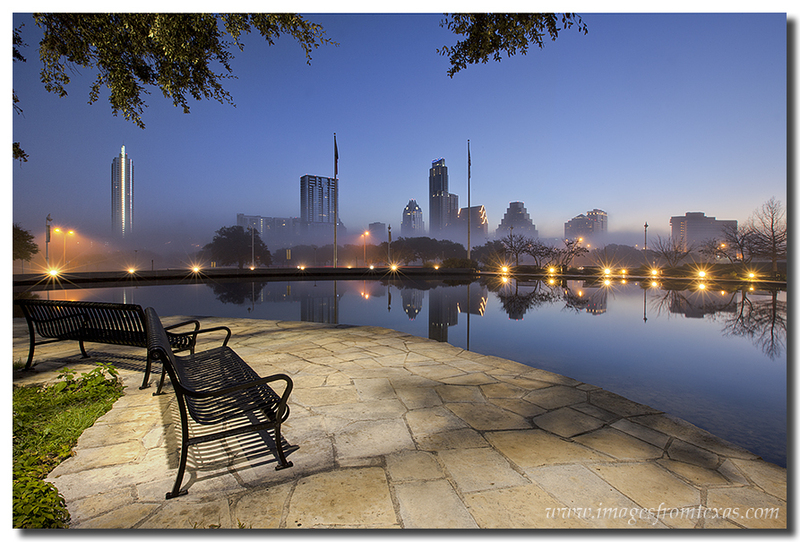 Here, though, is my image of the Austin skyline with a park bench – the best view in Austin! This bench has a wonderful view of downtown Austin, Texas, and the Austin skyline. On this morning before sunrise, looking across Lady Bird Lake, a low fog rested among the buildings and architecture of Austin.